Mantle or shroud, wool and cotton interlocked tapestry with overstitched edging. Charles Potter Kling Fund (1988.325). Photograph © Museum of Fine Arts, Boston. This rare and finely-made burial shroud, created in the Andean highlands using a technique called interlocking tapestry, is dated from the late Inca to early Colonial period, or about A.D. 1550 (just after the Spanish conquest). It is the only known mantle to display an all-over arrangement of t’ocapu, or pictorial symbols – 1,824 in total – and woven in 32 cotton warp threads/200 alpaca weft threads per inch, also making it one of the finest interlocking tapestries known. This burial shroud was studied by two Peruvianists who each advanced a different interpretation of the mantle’s essential purpose. At around the time the MFA was acquiring this textile in 1988, Alan Reed Sawyer, former curator at the Art Institute of Chicago and former director of the Textile Museum, Washington, DC, drew relationships between the compositional layout of t’ocapu and the stitched tri-color binding pattern in the weaving’s edge to the ritualistic procedure in which the shroud was intended to be wrapped around the body. After extensive iconographic analysis, Sawyer argued that the arrangement of symbols and patterning of the selvage binding served as visual aids to guide officiants in the proper protocols of burial. Some years later in 2003, Gary Orton of Harvard University, who also conducted a thorough investigation of these same elements, ascribed significance to the number of t’ocapu (1,824) as aligning with the count of five solar years, pursuing the hypothesis that the mantle was designed and made specifically to commemorate a five-year calendar. Detail of mantle or shroud with view of tri-color stitched binding. Wool and cotton interlocked tapestry with overstitched edging. Charles Potter Kling Fund (1988.325). Photograph © Museum of Fine Arts, Boston. Research suggests this mantle was made for a young Inca male adolescent of noble rank, created during the last vestige of his people’s great cultural empire – succeeded by Spanish colonialists. Correspondences in 1988 between Jean-Michel Tuscherer, the MFA’s Chair of Textiles, and Alan R. Sawyer who had studied the mantle in great detail, allude to the monumental treasure that was about to enter the Museum’s distinguished collection of Spanish colonial and ancient Peruvian textiles. 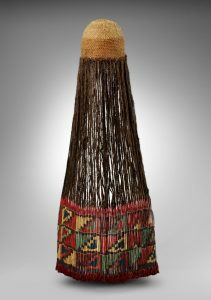 This masterwork of Neo-Incan culture has been off-view since its first MFA, Boston exhibition debut in 1992, To Weave for the Sun. Details of the mantle adorn both front and back covers of the exhibition’s catalogue by Rebecca Stone-Miller. It was recently installed in the Museum’s ancient South American gallery (LG33), where it will remain on view for one year.